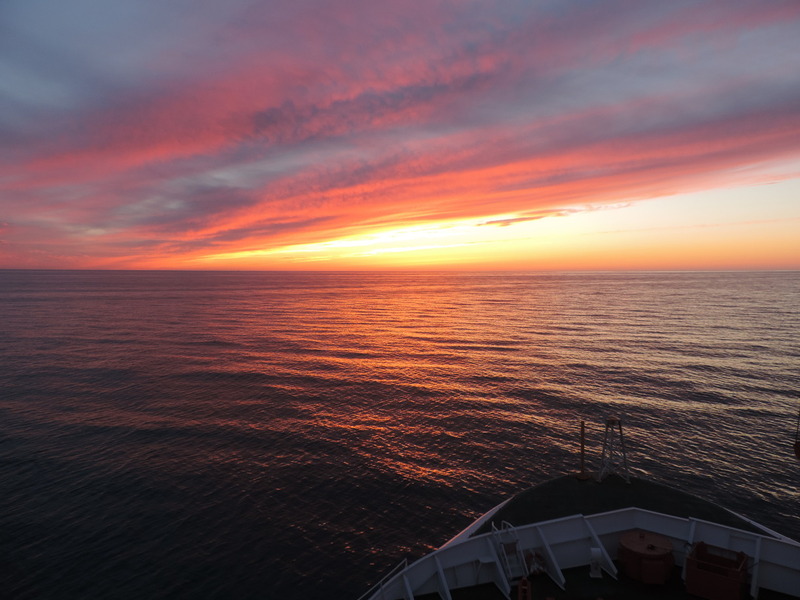 We are a few miles south-west of Stavanger, Norway passing through the rich oil fields of the North Sea between Scotland, Denmark, and Norway without any rig in sight. The sun has long set, but it still lingers just below the horizon painting the sky in vivid reds. Four young scientists huddle on an upper deck with clear view of this sky with blankets around their bodies for warmth that, so they tell me, they used to sit and watch for several hours of sunset. They are giddy and silly in witty jokes, gently teasing each other. It is the end of our long and strenuous first day at sea. 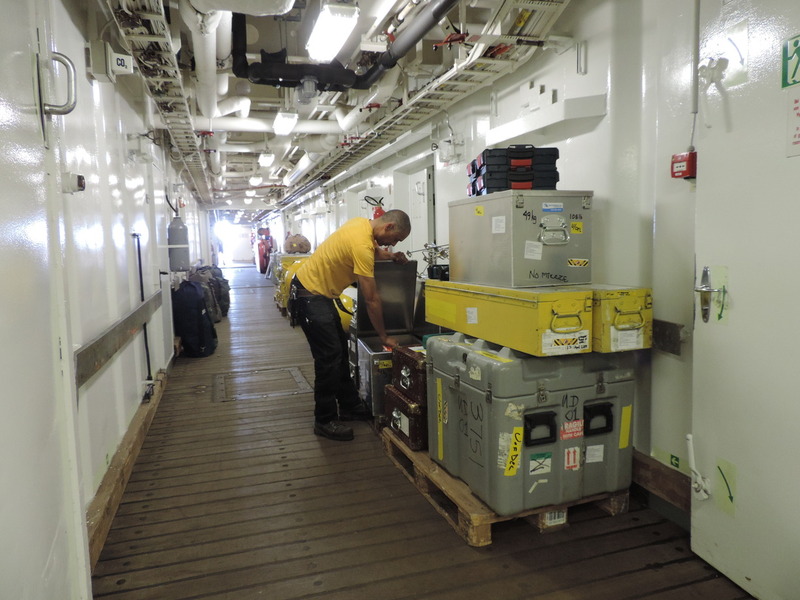 The first day at sea is always rough both physically and mentally: Lots of boxes with gear must be found, moved, emptied, and its content moved again. Space to work is set-up in unfamiliar environs. There are many people one does not know, but one depends on each other for help and support. People come from different cultures and countries with different ways to talk to each other to get things done. Some do not talk at all. And yet, through some mysterious magic, it all works out in the end. People are naturally curious and watch how others do things by visiting each others empty rooms become living and work quarters. People from different scientific disciplines have evolved along different lines and their way to do things differs, even a task as simple as moving boxes: Some like to stack many of them on palettes that are then moved by fork-lift, others prefer smaller carts that contain a single box only. Routines that give us comfort in daily life do not exist yet. Emotions swing wildly as there is way too much excitement. All the manual labor is done with high hopes of potential successes that may or may not bear fruit. Arctic ice can and likely will be cruel to some and blissful to others. Pleasures can be as small as a successful lift of an expensive piece of equipment moved vertically by crane from the F-deck to the A-deck far above. The crane had to swing over the water and did so, of course, without falling in. The scientist responsible had never seen such a thing and marveled exuberantly that her vertically profiling laser system is still there for her to do the science she is here to do for her PhD thesis work. I was one lucky guy receiving the news in the form of a massive verbal bear hug while grabbing myself a cup of tea. Fun. 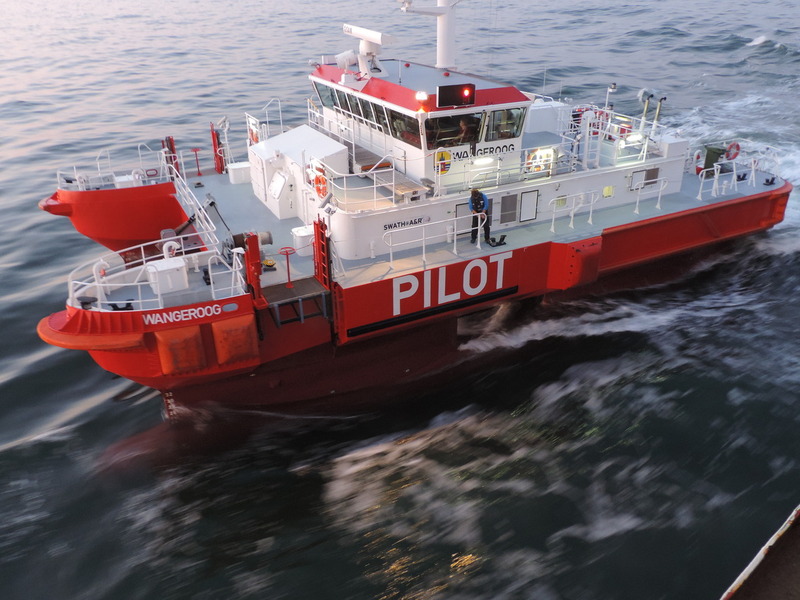 Hard to imagine that the pilot helping steer us out of the port of Bremerhaven left us only yesterday, the beginning of the first day now over. So much has happens aboard a ship, but I have to stop here as it is now 1am Sunday which is a regular working day. This entry was posted in Uncategorized and tagged Research Cruise. Bookmark the permalink.